Tune in October 21 for Glen Campbell: Good Times Again and learn about exclusive ticket and meet-and-greet opportunities to see the great American songwriter and composer Jimmy Webb’s upcoming Connecticut concert tribute to Campbell, who was his lifelong musical collaborator and friend. The now-legendary Glen Campbell was host of The Glen Campbell Goodtime Hour, which hit the airwaves in January 1969. The success of the program was due to Glen’s triple-decker talent as a musician, singer, and humorist, and the guests he brought on the show. It was the hottest show on TV during its four-year run. 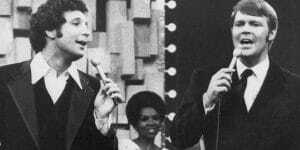 Viewers looked forward to seeing the chart-topping star along with an incredible mix of musical stars in rock, pop, country, and soul. Glen Campbell: Good Times Again is a special that presents the biggest stars and the best musical performances from the series. Hosted by Glen Campbell himself, viewers will love revisiting the performances of some of the hottest talent of the period. On CPTV: Saturday, October 21, 2017 at 7:30 p.m.